The last three weeks have been very enriching. I was busy in intense meetings to exchange ideas and discuss how technology can allow us to perceive and understand the future. It began with the visit to theApplied Innovation Exchange( AIE) Lab in San Francisco, awesome environment to develop an ecosystem and launch reflections but also practical experiments on new subjects or advance phases. It was also a great opportunity to meet the representatives of the Institute for the Future. Identify the changes in personal and global society behaviors for example from Ownership to Access for cars and analyze the way to take benefits of these changes. 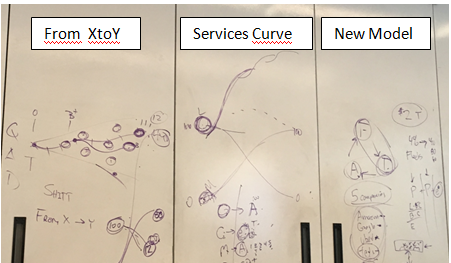 Create new sets of services based on new capabilities and thinking about the way to reduce painfulness, save time and increase comfort and ease. What does it mean for my business innovation as part of its transformation? How to set up a platform to facilitate its implementation? How to accelerate the implementation and with what results? Many companies (not all but the majority) have now launched action plans to put an environment conducive to the creation of such a platform for innovation by incorporating the principles of co- innovation, challenges and open innovation. But, the critical point lies in the distribution and dissemination of the results of this platform in the company’s activities. The challenge is to “connect the dots” without killing initiatives in the bud by the risk management process. The time factor is also clearly taken into account but it is interesting to go beyond the obvious that “being the first” is the key to success. Even if the premium is the first effective and real, many examples show for different reasons that meeting the market expectations or create appetite for new features is not always that simple. 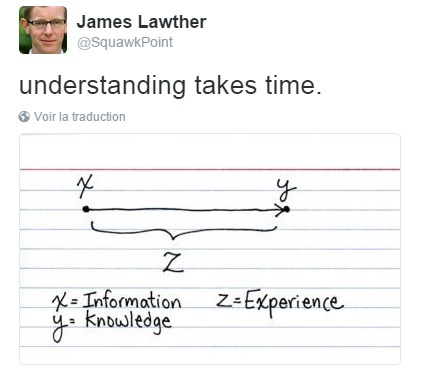 Going back to the points raised by IFTF, a tweet from James Lawther (@SquawkPoint) puts an interesting and simple equation into perspective, the journey from information to knowledge. This equation must be enriched by adding to it the vector speed provided by a proper eco-system. This speed can be modulated (acceleration or deceleration) taking into account the necessary precision and feedback from users and end customers on the services offered. “Hey you, do not Watch that, Watch this!” The first words of the famous song of Madness can perfectly illustratethe much needed new approach. . Using a chart from 1964 even remixed in 1979 is somewhat misleading to talk about innovation in 2016 but who cares and elsewhere may be,this will give you the desire to watch this song again.